“A walking billboard for her brand” is how the Wall Street Journal describes Ivanka Trump. According to a new report from the newspaper, which tracked the outfits Ivanka Trump wore during public appearances and on social media between March—when she appointed an adviser to her father—and the end of October, the Trump daughter wore her own brand 68 percent of the time. Trump, who still owns her eponymous brand, is in what the WSJ describes as “uncharted territory,” or murky ethical waters that raise a series of questions about federal rules that prevent employees from using their high-profile public positions for personal enrichment. Though Trump, like her father, has placed her fashion brand into a trust (Ivanka’s is run by family members), she still profits from the company, suggesting that her decision to effectively model her clothes to potential consumers is financially motivated. Presidential first ladies and daughters can potentially make millions of dollars for apparel companies by their fashion choices. A study of Michelle Obama’s outfits in her first year in the White House, by New York University finance professor David Yermack, found that stocks of design firms and retailers typically spiked after she wore their apparel. The difference for Ms. Trump is that one of the brands she can promote in this way is her own company. That difference is a substantial one, but certainly in keeping with the broader ethical problems involving the Trump-owned businesses that have plagued the White House. While Trump has removed herself from directly endorsing her brand since November, when her brand promoted a bracelet she wore on 60 Minutes appearance, ethics experts tell the WSJ that Trump should stop wearing her brand entirely in order to avoid conflicts of interests. For her part, Trump denies that she’s using her position to advertise for her brand. 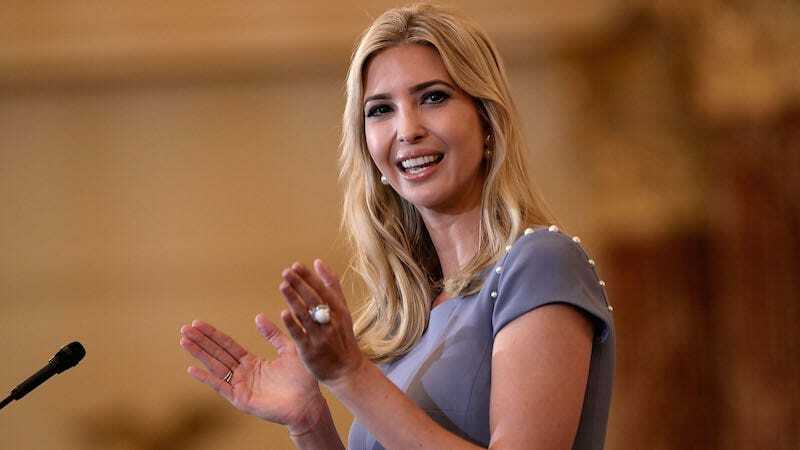 “If what motivated me was to grow my businesses and make money, I would have stayed in New York and done just that,” she said in a statement to the WSJ, echoing what’s become the Trump family party line.